*Disclaimer: this post doesn't have any spoilers or information that isn't accessible online already. I was very lucky to see Love Simon early in Cineworld as a Secret Unlimited Screening. This was a really nice surprise as there was zero information about the film before screening, and I wanted to watch this film anyway! Myself and my boyfriend missed a small fraction of the beginning of the film, so for the first ten minutes or so I wasn't sure what film I was watching, until it was revealed that Simon is gay. 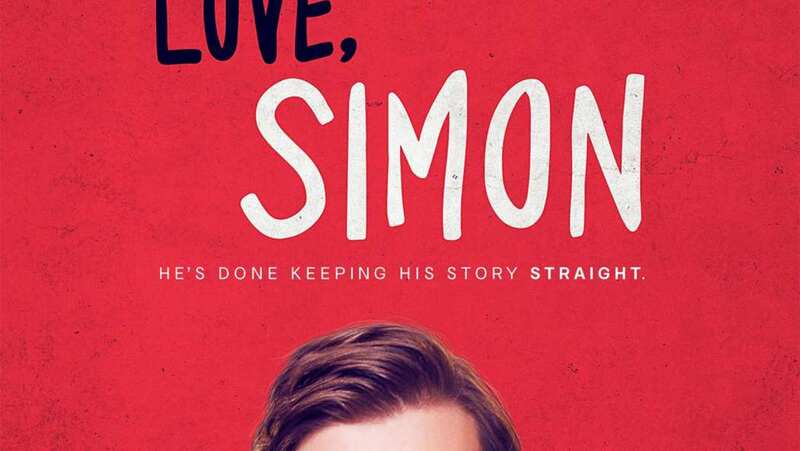 Love Simon is about a guy in high school who is secretly gay, he fantasises about a new homosexual lifestyle when he will move away to college to be openly gay. He doesn't plan on telling anyone until he reads on an anonymous website that there's another closeted gay guy at school. The film then turns into this mystery-love story, which keeps the audience trying to guess who the mysterious gay guy is. It uses hilarious and heartfelt fantasy scenes to display what's going on in Simon's head. I love that Nick Robinson who plays Simon just looks like a regular guy, that the filmmakers haven't portrayed him as a "stereotypical" gay guy - not that there is a stereotype, it's just that previous films can have certain depictions of gay characters. Whilst watching Love Simon, I wondered why is there only now a film aimed at young adults with a gay main character hitting mainstream cinemas? It's 2018? It feels like this film should've come out years ago. From my perspective gay characters are usually the protagonists "gay best friend", this is probably the first one I've watched where they are the main character. And I love it. I love that this was chosen for the secret screening, as people of all ages and with different film preferences would've been drawn in for this. They potentially might not have seen any publicity for this film. I don't think anyone walked out of my screening, but I read online that some people did. Fair enough it's not for everybody, but you could at least sit down and see how the film pans out. I also read that whilst a lot of people said they wouldn't have chosen to watch the film, they actually loved it. My boyfriend really loved this film - and he's not a fan of young romantic comedies! How cool is this badge I picked up from Cineworld?! There's a short clip on YouTube you can watch of one of the funny scenes, where some of the characters come out as straight to their parents. It's a fantasy scene, but it's completely relevant as it's asking why is straight the default? I think when families bombard you with questions like "so when are you going to get a girlfriend/boyfriend?" (delete as appropriate) We could instead change it to "so are you interested in anybody?" or "are you in a relationship?". These are just brief examples I've thought of, but my point is why are we assuming the sexual orientation of other people? I remember getting these loaded questions when I was younger - I am straight, so it never offended me. It must be hard for those wanting to come out to family and friends if they've been on the receiving end of straight orientated questions. I think Love Simon can open up a discussion amongst people of all ages, but most all of it's a really enjoyable film. The film has a really good structure to tell the story, and even though it's been two weeks since I first saw it, it's still on my mind and I will have to see it again. I definitely recommend this film to watch, as it'll have you laughing and nearly crying at the same time, you get to go on a journey with Simon. Love Simon is out in cinemas NOW.